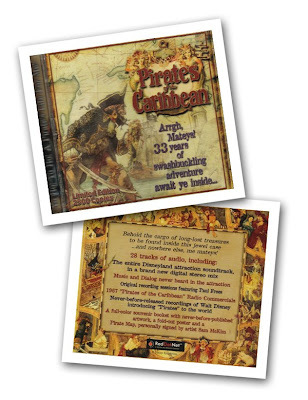 The Pirates of the Caribbean attraction has a storied and well-reported history. Like its counterparts It's a Small World and the Haunted Mansion, which can all be found in parks around the world, a tune was created for the attraction that would prove to be an iconic work in Disney theme park lore. "Yo Ho (A Pirate's Life for Me)" has surfaced time and time again on theme park soundtracks and is a perennial favorite in the genre. X Atencio had been brought on to the Pirates project in 1965. His background had been in animation and he had been doing some work with audio animatronics when Walt Disney asked him to work on the script for the Pirates attraction. As development of the attraction progressed, many Imagineers were worried that the entire premise of the attraction might not be "Disney" enough given the debauchery and drinking taking place. Atencio decided that a sea chantey might lighten the mood and provide a sense of continuity for the show. Using the old saying "Yo ho ho and a bottle of rum" as inspiration, he came up with a few lyrics and some ideas about the tune. After presenting his rough version to Walt, he was paired with Disney music veteran George Bruns. Atencio completed the lyrics while Bruns scored the piece. The finished song was recorded for the attraction by the Mellomen. The music and other audio from the attraction have been released in various forms. The storyteller record set included audio from the attraction, as well as sound effects and music tracks borrowed from other record releases. For the attractions 33rd anniversary, a limited edition CD was released that included the entire attraction audio, early and unused versions of the attraction's song and music, voiceovers, commercials, and audio from a press conference in which Walt described plans for the attraction. This collection was later made available in general release, although without the press conference or commercial audio. The version I bought was at one of the Wonderland Music kiosks. After a few years the disc stopped working. Good thing I made a copy of it! Here's a unique Pirates memory:I remember a flood that occurred in 1985-ish when a sewer main broke or was clogged so that water started pouring in through the drains in the restroom located near "The Pit" (Cast Member restaurant) in the "Cast Members Only" area located backstage under New Orleans Square. This restroom and cafetria were located right beneath (or at least beside) the Pirates, in the bowels of New Orleans Square. I worked Day Custodial at the time and we had large bags of dirty linens that we used as sand bags to block the flooding restroom. The bags in the doorway held back the water until plumbers could arrive. The water got pretty darn deep in that restroom in the interim (almost thigh-high). Nothing like some sewer water to liven up lunch at "The Pit." They got the flood under control eventually and everything was cleaned up. Pirates had a way of flooding (what can you expect from a 20+ year old water ride?). Nevertheless, New Orleans Square and the Pirates remain among my all time favorites at the Park. Great to see the "old" Pirates stuff you posted! I'm kind of a Disney "purist," so anything that harkens back to the roots of POTC and Haunted Mansion (as they were originally designed and built) always hits my core sensibilities!